A Wilco fanatic since high school, I purchased tickets to see Wilco the day they came out, borrowed money from a friend, and performed some unmentionable favors to secure great seats. Without hesitation or reservation, I can say that this was all worth the effort. Finally seeing a band that you’ve cherished for a long time creates a huge potential for disappointment. The band, however, lived up to and surpassed all my expectations of their musicianship, chemistry, charisma, and—ultimately—their beauty. Opener Joanna Newsom took the stage before the sunset, wielding a harp and her dynamic vocal range. Classifying exactly what Newsom does is difficult, but progressive Renaissance folk might come closest. Her compositions are labyrinthine, warped, and dramatic; each one almost feels like a morality play turned into a miniature opera. The theatrical sweep is enhanced by her inviting storyteller’s voice. Neal Morgen (drums/ percussion) and Ryan Francesconi (tambura, kaval, guitar, and everything else under the sun) are technically gifted musicians working with subtlety and craft, honed toward achieving Newsom’s awesome vision. However, nothing could have prepared me for Wilco’s brilliant blend of beauty, power, noise, and nuance. They kicked things off with the rocking “Dawned on Me,” from their latest album. Instead of sounding new or unrehearsed, all of the songs off the Whole Love sound lived in, sidling up comfortably to songs that Wilco has been performing for over a decade. This song in particular kick-started the evening with a punchy and precise guitar onslaught, presaging the gun slinging to come. Of course, though, Wilco varies their approach, not hitting you with flamethrower riffs for the entire show. In fact, front man Jeff Tweedy plays an acoustic guitar through about half their set. 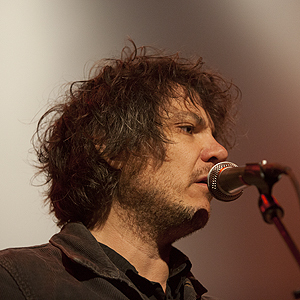 Their re-imagining of “Spiders (Kidsmoke)” was a great example of this range: originally an electronica and atonal guitar solo raga, Tweedy plucked out the main melody on his acoustic guitar and transformed it into a gentle love ballad. Backing him up, the band highlighted their soft side as well, adding graceful intricacies that never distracted from the simple power of the moment at hand. Another unexpected surprise was how well the new members fit in to the old songs. This is truly amazing. Between guitarist Nels Cline, keyboardist Mikael Jorgensen, and keyboardist/guitarist Pat Sansone, they are able to convincingly approximate all the studio trickery and noise manipulation of “Misunderstood.” When the band went into “Hummingbird,” Cline was able to recreate the doubled violin-and-guitar solo with his brilliant use of delay and fuzz tones. Deftly, this moment led directly into Jorgensen handling the sample-crazy intro of “A Shot In the Arm.” By the end, the whole audience was undulating along with the swathes of feedback Sansone and Cline were laying over them. For the first encore, the band opened with “Ashes of American Flags,” keeping up their melodic and noisy genius. They accented material off of Yankee Hotel Foxtrot, walking off the stage after Glenn Kotche-showcase “Heavy Metal Drummer” and fuzz rock freak out “I’m the Man Who Loves You.” But the fans were restless, clamoring for more. The band graciously came out to perform a quick second encore, starting with the nonsense boogie-woogie of “Hoodoo Voodoo.” To ensure that everyone would leave satisfied, Sansone stepped out from behind his keys and put on a guitar so the band could rip into a version of “Outtasite (Outta Mind).” Trading searing leads, the three guitarists in the band rocked the Bowl front to back, while Tweedy and bassist John Stiratt harmonized majestically. By the end of the evening, I realized a dream I had carried in my back pocket for nearly a decade. I got to see one of my favorite bands live, and they weren’t just great—they were mind-blowing. This may be the best concert I’ve ever seen, I strongly suggest you go out of your way to see Wilco if you can.